While Numero® has proven to be very popular purely as a game for all ages from 3 to 80+, teachers should soon realise that it is much more than a game. Indeed, as a teaching technique, teachers and principals have hailed it as ‘transforming’. This regular use, however, does bring up the question of time allocation. If too much time is used for preparation or packing up, this will certainly restrict its use. (Any teaching aid that requires lengthy preparation will soon be consigned to the bottom shelves of cupboards!) 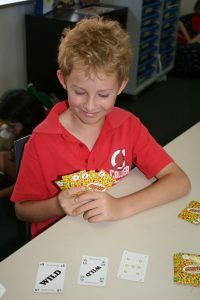 If, at the end of a Numero® session, children have to re-sort their packs, removing Wild Cards, this will detract from its effectiveness, popularity and use. Of course, if sets of Numero® have to be shared among various classes, this problem is almost unavoidable. Where a class has its own set, the benefits of Numero® are much more evident. As soon as a school receives its cards, all packs should be numbered. That is, all cards in one pack are numbered ’1′, another ’2′, and so on. Further, we suggest that different class sets should be identified, so that one class would use, say, a black marker, another red, and so on. Then, if cards happen to be dropped on the floor, or even outside, the number and colour will immediately tell to which class set and which pack a card belongs. Numbering packs may be a rather onerous task, but the effort spent will be saved many times over. 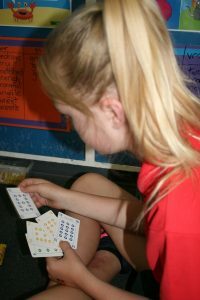 Numero® readily caters for different ability levels in the one classroom so that while one pair might be playing with Number Cards only (using addition only), others could also incorporate subtraction, others multiplication and division, and others fractions. If the packs are numbered, and a class has its own set, at the end of the allotted time, the teacher may just say, ‘All stop playing. Put your hands down on your desks. Pick up the stack of cards you have won. Count them to see who has won your game, then put all your cards straight back into your pack’. The packs are then collected in just a few moments, and the class can continue with the rest of the mathematics lesson or whatever. At the next Numero® session, each pair is simply given the same numbered pack, containing the Wild Cards they are using. So, without any wasted time, all students are immediately able to begin playing at the correct level for their ability. However, other teachers have recently explained how they use Numero® on a daily basis for about 15 minutes at the end of the mathematics lesson. These teachers tell us how students are quick to let them know when it’s time for Numero®, and say that their mathematics lessons have never been so productive as children do their best to ensure that nothing delays their Numero® time! 4. Challenges, Records and Motivation Generally! Class teachers have used Numero® in a wide variety of ways, with great success. INTER-CLASS COMPETITIONS: These have proved popular where class members are graded into two divisions, and then pairs are drawn at random. Great prestige is felt by the class that wins the most games and becomes ‘Champion Class’! CLASS RECORDS: A Numero® corner on the blackboard shows ‘Best Takes’ (number of cards won—or at higher levels, points scored—in a single take), or ‘Highest Score’ (number of cards won—or at higher levels, points scored—in a full game). CHALLENGES: These provide one-off hands of Numero® where the player must suggest the best possible move. This can be used most effectively on a school or even class basis, where the teacher sets the challenge weekly and children work out their best solutions. One with even greater potential is where children are encouraged to set challenges for the rest of their class, having already worked out the ‘best play’. 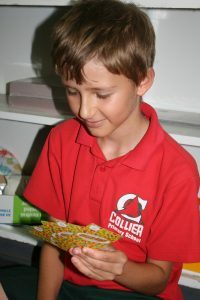 If a number of students prepared separate challenges for the class, the challenge that had least children able to work out the ‘best play’ would be declared the ‘Top Challenge’. 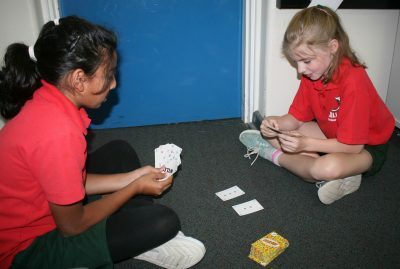 Numero® CLUBS: Students in both primary and secondary schools are now enjoying lunchtime Numero® clubs, where students from a mix of classes, join together—not ‘doing Maths’ but ‘having fun!’. Adults, too, are now showing that Numero® is not just a game for children, nor just a teaching strategy for the classroom, but a challenging and fulfilling game. Some teachers of junior primary classes have found that though children really love playing Numero®, once it has been learned, the easiest way to teach it is in small groups (or with parent helpers where possible). Others have used the ‘buddy system’, bringing older children in to play Numero® with the younger children on a one-to-one basis. This serves to clarify rules even further with the older children, as well as boosting their self-image. 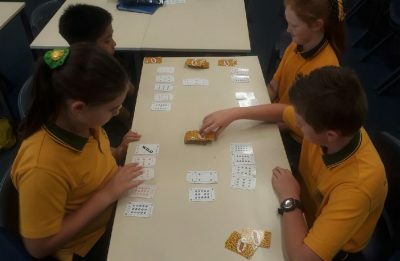 This aspect of Numero® is seen to be so important by some teachers that they have instituted a ‘Class Rule’ that if children forget to say the build aloud, it is disallowed and the card/cards used are separated as discards.